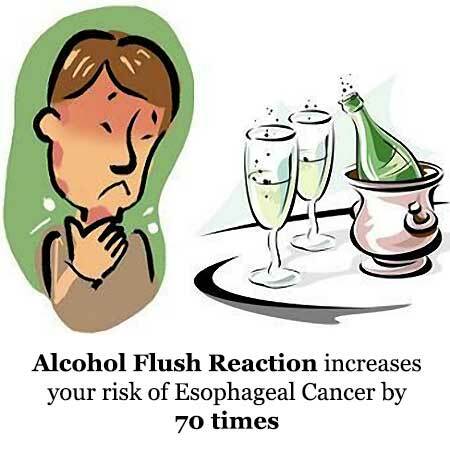 Alcohol Can Increase the Risk of Esophageal Cancer by 400 Times!? Some people tend to drink alcohol almost every day after work, or during holiday. The reason is simple–it's refreshing, fun, and delicious. But, is it really all right to drink every day? They say that moderate drinking is good for the body. But many people are not aware that excessive alcohol use can increase their risk of cancer as well as heart failure, making it important for you to know how much alcohol is too much. In the past, we have featured an article entitled "Esophageal Cancer: What You Need to Know" explaining that facial redness due to too much alcohol intake can increase the risk of esophageal cancer (or oesophageal cancer) by up to 70 times. However, we have found that there is another risk factor that can multiply the risk of esophageal cancer by 400 times! Acetaldehyde is the known carcinogenic substance that can lead to esophageal cancer. Acetaldehyde is produced when alcohol is metabolized in the liver. Acetaldehyde is actually more toxic than alcohol itself, and it is responsible in causing hangover symptoms. In fact, it is also a carcinogen due to the fact that it can hinder a cell's natural ability to repair itself. Acetaldehyde can spread throughout the body through the blood vessels. But healthy individuals are protected from it as the body produces an enzyme called aldehyde dehydrogenase-2 (ALDH-2) that can break down acetaldehyde into acetic acid, which is practically harmless. Some people, though, have genetically weak or insufficient ALDH-2 enzymes, and therefore make the esophagus susceptible to acetaldehyde attack. In addition, high amount of acetaldehyde in the body causes capillary dilation. This leads to "alcohol flush reaction" or facial redness especially to people of Asian descent. That is why research suggests that people who experience facial redness after drinking alcohol are at risk of acquiring cancer of the esophagus by as much as 70 times. However, a new discovery in Japan shows that people, who drink a lot of alcohol and still do not show facial redness, are 400 times at risk of esophageal cancer! How can that happen? No Facial Redness Even After Drinking a Lot of Alcohol? Beware! If a person's face doesn't turn red after drinking alcohol, then why the risk of cancer is suddenly 400 times? It should mean that the alcohol and acetaldehyde are being metabolized in the body properly, right? Wrong! In fact, it's the complete opposite—the body can't metabolize both alcohol and acetaldehyde! Here's what happens. When your liver can't break down alcohol easily, it will remain in the body and circulate in the blood. It will also leave the body through bodily fluids like saliva. Now, the problem lies in your mouth. Your liver isn't the only one that produces acetaldehyde. The oral bacteria lurking in your mouth will also metabolize alcohol into acetaldehyde, and will pass through your esophagus rapidly. On the other hand, even though your liver can't easily break down alcohol, it will do so gradually over a long period of time. Your face won't be so red, but acetaldehyde will be produced continuously throughout your body. If you do not have hangover symptoms and facial redness after drinking, yet you are reeking of alcohol the next day, then you may be the type of person that is 400 times at risk of esophageal cancer. Protect Your Health With Early Detection! Chest pain and difficulty swallowing are some of the most common symptoms of esophageal cancer. 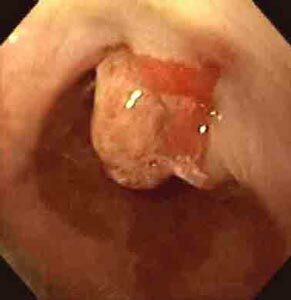 However, early stages of esophageal cancer are very difficult to detect since it does not show any obvious symptoms. One of the known methods to detect early stage of esophageal cancer is by using iodine solution. If you are a heavy drinker, we advise that you consult your doctor for in-depth diagnosis. Drinking too much alcohol can increase the risk of esophageal cancer. The magnitude of risk of acquiring cancer varies from person to person. Here, we'll classify them into four types. Of course, we highly advise that you limit your intake of alcoholic beverages even though you belong to the low-risk type of individual. Note: The data shown below are only theoretical numbers but you can use it as a guide to determine your risk of acquiring esophageal cancer if you drink too much alcoholic beverage every day (rice wine in this case). In this data, one serving of rice wine is equivalent to 180 ml. 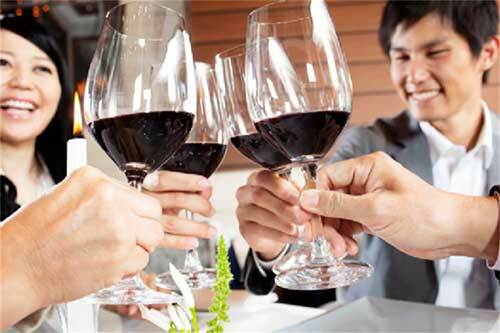 Description: The person's body can properly metabolize acetaldehyde and alcohol. People who fall under this type can be called "heavy drinkers", meaning the body is already addicted to alcohol and is dependent on it to function normally. Description: The person's body can metabolize alcohol properly, but cannot break down acetaldehyde. Description: The person's body has weak metabolism of both alcohol and acetaldehyde. Because acetaldehyde is being gradually produced by the body, facial or skin redness isn't quite obvious. Description: The person's body has weak alcohol metabolism, but the body can properly convert acetaldehyde into acetic acid. No hangover symptoms appear but because of oral bacteria, acetaldehyde is still produced in the mouth and can quickly pass through and directly affect the esophagus. All the information above thus far, is merely a scientific explanation that we are providing so you know what happens to your body if you are a heavy alcohol drinker. Still, it is worthy of noting that not all heavy drinkers get cancer. Even light-to-moderate drinkers can develop cancer. That is why scientists only say that alcohol is linked or related to causing cancer but it is not necessarily the root cause. The same thing applies to cigarette smoking. The correct way to say it is that they act as "cancer promoter" thereby increases the risk of an individual in acquiring cancer diseases or worsen an already-existing cancer, especially if the person has poor genetic makeup. What actually happens is that alcohol and smoking can easily attract the outside negative energy force, which is the real root cause of cancer. To learn more about this negative energy, read our information on how the PYRO-ENERGEN electrostatic therapy machine works. Using the PYRO-ENERGEN machine, while at the same time limiting or even refraining from drinking and smoking, will help ensure that you maintain good health and overall wellbeing. Please feel free to share any thoughts you have about alcohol and esophageal cancer. Post your feedback in our comments section at the bottom of this page.